In 2000, I fell in love and began an incredible experience. I co-raised a service dog, Elway II, for a nonprofit organization to assist someone in a wheelchair. It was the beginning of a series of love affairs with these adorable, talented and mischievous pups (often Golden or Labrador Retrievers). While volunteering at Canine Partners of the Rockies (http://www.caninepartnersoftherockies.org/), I met many people with disabilities who didn’t know much about traveling in a wheelchair. This inspired me to choose a new full-time niche within the travel agency industry. Nowadays, I’m a pup sitter rather than a raiser, and I volunteer at various nonprofit events and fundraisers. These pups have taught me a great deal. Many have gone on to partner with their special person and some have retired or passed away. Dogs can often be found in my office on top of a wheelchair-accessible cruise ship’s deck plan, tethered under my desk, or crated when they are very young. Occasionally the youngsters will whine or bark while I’m on the phone (embarrassing!!!) until they learn their “quiet” skills. The older dogs may be keeping my feet warm on cold winter days in Denver. Often, there’s more hair in my office than on my head. Balancing work, home and volunteering can be a challenge. People ask how you can train and then give them up. It’s a 24-hour job but full of rewards. Watching a pup graduate with his partner is a terrific high. There are tears of farewell but thrills of success when we see what these dogs mean to their partners – love; companionship; more social interaction with people; physical jobs of retrieving, pulling, opening, carrying a grocery bag, or alerting; independence to pursue college and jobs; and so much more. So….we give them up gladly and hopefully see them make a tremendous difference in a special life. As a fellow raiser once said, we then cry, drink a bottle of wine, and start over with a new pup. A few dogs don’t complete the program for medical, training, or temperament reasons. Many of those get a new career as a therapy, drug enforcement, or search and rescue dog. 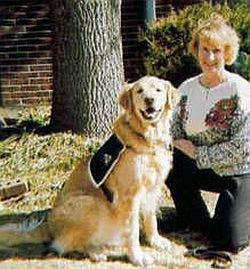 Some of these service dogs go on cruises with their partners – involving early planning and arrangements. Stay tuned for an article in the works about traveling with a service dog. Vicki Thorp is an Access Travel Team Specialist with Connie George Travel Associates / www.WheelchairCruising.com.